A rollout project is a set of automated steps for a software distribution or patch management task. When content is added to a rollout project, it progresses through the steps. For each step, you can perform actions, set criteria for when the content should move to the next step, and send notification emails. The project processor is a scheduled task that applies the actions, moves content from step to step, and sends the emails. For information about how the project processor works, see How a rollout project works. You must select the project type and save the project before you can add steps to the project. This is because there are different steps available depending on the project type. The following options are available, depending on the type of rollout project you have created. •Autofix settings: Changes the Autofix setting for the definition. This can enable or disable either global or scoped autofix. •Group membership: Changes the group membership for the definition. •Scan settings: Changes the scan status for the definitions. This may include changing that status to scan, do not scan, unassigned, or approved for scoped scan, or it may change the scopes that scan for the definitions. •Tags: Adds or removes tags from the content. •Patch task template: Selects the task template to use when creating tasks associated with this step. Tasks created for a rollout project can be viewed in the task scheduler, located in the Auto-generated rollout project tasks folder. The tasks are created when the step has content in it and the project processor runs. NOTE: This option refers to a scheduled patch task created by the project processor when the project runs. It is not the same as the project processor scheduled task. 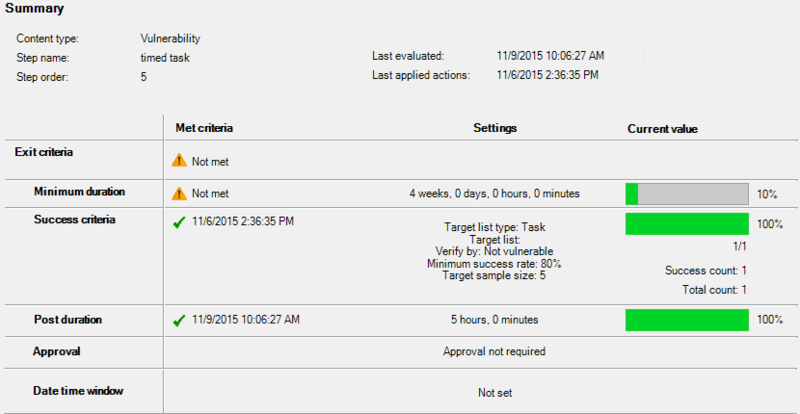 •Targets: Selects the targets for the patch task. All of the exit criteria for the step must be met AND the project processor (a scheduled task) must run in order for content to move to the next step in the project. Content does not move to the next step as soon as criteria are met; it remains in the current step until the project processor runs. For information about how the project processor works, see How a rollout project works. To see if a definition has met the exit criteria for the step it is currently in, find the definition in the Rollout projects tool, right-click the definition, and select Properties. •Keep content together: On the Exit criteria page, the Keep content together when advancing to next step option forces all content that enters the step simultaneously to leave the step simultaneously. This option allows an administrator to keep similar or associated content all in the same step, making it easier to track. When the Keep content together option is set for a step, content cannot progress to the next step unless all of the content with the same Applied actions timestamp is ready to move to the next step. If you want to keep content together through the entire project, enable the Keep content together option for each step of the project. •Minimum duration: Determine the minimum length of time that content must remain in the step. •Success rate: Determine the percentage of target devices that must either have the patch successfully installed, or are not vulnerable. To check the success rate, the project processor examines the scan results for target devices. For tasks that are targeting large groups, we recommend limiting the number of devices that are checked, and using the success rate of the limited sample rather than trying to determine the success rate for all of the targeted devices. •Additional duration: Requires the content to remain in the step for the specified time after the success rate has been met. NOTE: If you configure both Minimum duration and Additional duration, the two timers can run simultaneously. For example, if a step has a minimum duration of four weeks, but the definition meets the success rate after one week, the Additional duration timer begins as soon as the success rate is met, even though the Minimum duration timer is still running. •Approval: Blocks the content from advancing to the next step until a Ivanti administrator approves the content for advancement. To approve content, find the content in the rollout projects tool, right-click it, and select Approve. •Date time window: Restricts the date or time that content can leave this step and move to the next step. Content does not automatically move to the next step during the date time window. When you use a date time window, the content must meet all of the exit criteria and the project processor must run during the date time window for content to advance to the next step. Make sure that the project processor runs during the date time window that you create, or else the content will never leave the step. There are two lists for email recipients: one for all rollout projects and one for individual projects. When you add recipients to the address list from the step properties, you're adding them to the project recipient list. You cannot create an email recipient list for a specific step. When content is in a step that has email options set, the project processor sends an email when the expected duration has been exceeded, the exit criteria have been met, or the content needs approval. •Duration exceeded: Sends an email to the addresses on the project email list when the content has been in the step for longer than expected. Configure the amount of time you expect the content to stay in the step. If content stays in the step past that time, recipients receive an email each time the project processor runs and the content is still in the step. You can restrict how frequently emails are sent by setting a minimum interval, but that interval only applies to the current step. •Exit criteria met: Sends an email to the addresses on the project email list when the content has met the exit criteria for the step. The content progresses to the next step without administrator action. •Approval: For this option, you must enable the Approval exit criterion. When all other exit criteria have been met but approval is still required, the project sends an email requesting approval. If content stays in the step, recipients receive an email each time the project processor runs and the content is still in the step. You can restrict how frequently emails are sent by setting a minimum interval, but that interval only applies to the current step. The action history displays the actions associated with the step and the content in it. You do not configure anything on the Action history page. •Schedule distribution task template: Selects the task template to use when creating tasks associated with this step. Tasks created for a rollout project can be viewed in the task scheduler, located in the Auto-generated rollout project tasks folder. The tasks are created when the step has content in it and the project processor runs. NOTE: This option refers to a scheduled software distribution task created by the project processor when the project runs. It is not the same as the project processor scheduled task. •Targets: Selects the targets for the distribution task. •Success rate: Determine the percentage of target devices that must have the software successfully installed. •Approval: Blocks the content from advancing to the next step until an Ivanti administrator approves the content for advancement. To approve content, find the content in the rollout projects tool, right-click it, and select Approve. •Duration exceeded: Sends an email to the addresses on the project email list when the content has been in the step for longer than expected. Configure the expected duration and how often the email recipients receive emails for the rollout project. This reduces email traffic when several definitions complete steps at the same time. •Exit criteria met: Sends an email to the addresses on the project email list when the content has met the exit criteria for the step. 1.Select the rollout project, and make sure that the project is paused. You cannot add steps to a project while it is active. 2.Click the New project or project step button in the toolbar. 3.In the Project step properties dialog, provide a name for the new step and configure the options. On some pages, you must enable the checkbox in the upper left corner before you can edit the options on the page. NOTE: By default, when a step is created, it becomes the first step in the project. To move the step to a different position in the project, you can either change the Run order option at the top of the Project step properties dialog, or save and close the step properties and drag the step into the correct position. 4.Click OK to save the step. 5.Change the state of the project back to Play. If the project is paused, content will not be processed the next time the project processor runs.